The Makoko Floating School, a three-story building that floats atop recycled barrels. Over the last couple months, winter storms have lashed the Massachusetts coastline, leading to flooding in Boston and drastic property losses in coastal areas like Plum Island. Should we respond by moving entire towns? Fortifying them against the water? Last week the Harvard Gazette ran a story about a Nigerian architect with a different idea: float them. On March 7, Kunlé Adeyemi spoke at Harvard about his “African Water Cities Project,” which might sound like science fiction, but is already underway. In Lagos, which sits flush with the Gulf of Guinea atop swampy terrain, Adeyemi is in the early stages of building a modular, floating city inspired by makeshift dwellings used in a swampy slum neighborhood called Makoko. In Makoko, as Adeyemi told the Gazette, residents row to market and travel by gondolas between each other’s houses, which are built on stilts. 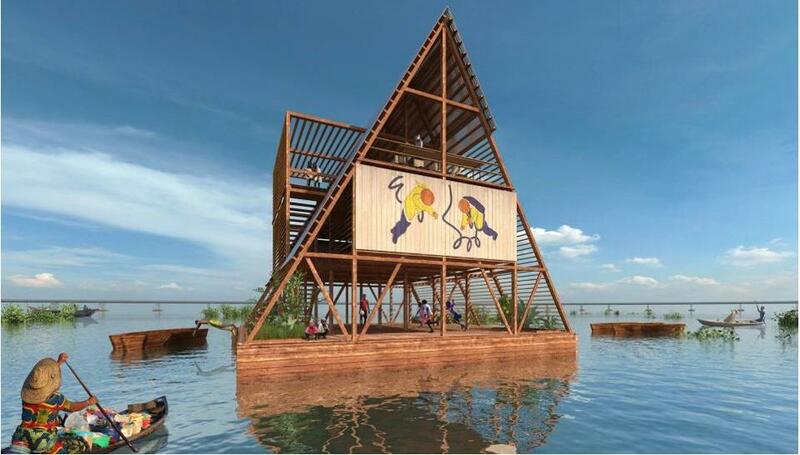 Adeyemi wants to formalize the bootstrap innovations found in Makoko; his prototype structure, which was dedicated earlier this year, is the Makoko Floating School, a three-story, 720-square-foot building built from wood and bamboo that floats atop recycled barrels. Which, of course, is all well and good as long as there’s still a choice. Melodrama tends to be applied as a pejorative—a way of knocking Hollywood schlock that tugs on our heartstrings while resolving into formulaic endings. But in an essay that ran last week on the website Medium, dramatist David Mamet argues that melodrama can be great art, too, and he offers a rule for distinguishing between bad and good examples of the genre. All melodramas, he proposes, are driven by questions. In bad melodrama, the answers to the questions are obvious from the start. Good melodramas reward with surprise answers—and the very best ones, he argues, surprise by showing us that the questions we thought we were considering weren’t really the main questions at all. Mamet tags “Mr. Smith Goes to Washington” as an example of “lesser” melodrama because the ending is as obvious as it is satisfying. Better melodramas, Mamet contends, include “The Sixth Sense” and, more recently, the Denzel Washington movie “Flight.” Both achieve surprise by shifting at the last second what you thought they were about. It’s not that those movies end on “A” when you thought they would end on “B.” It’s that the choice all along is revealed to have been between “C” and “D.” It’s hard to explain Mamet’s thinking without using examples that would spoil these movies, but suffice to say that the kind of ending he’s talking about isn’t just a surprise—it reframes everything you’ve seen, and jogs you with a new perspective on your own life. The most interesting part of Mamet’s essay is where he explains how to write good melodrama. In order to surprise viewers, Mamet says that the writer needs to manage to surprise himself. “The audience will foresee anything the Dramatist has foreseen,” he writes. “They will beat you to the punch every time, and figure out that The Butler Did It, unless the writer is prepared to undergo the same process as the Hero.” Of course, if this were any easy feat, every screenwriter would do it and we’d have fewer bad movies. Ebon Heath creates typographic sculptures—large, mobile-type constructions wrought from words. Heath, who lives part time in Brooklyn, calls his series “Stereo.type,” and he explains on his website that he hopes his work will provoke viewers to “listen with their eyes.” Even if you don’t read (or hear) the words that make up Heath’s sculptures, his use of letters as construction material has an immediate visual impact. The lines and gaps create an impression of depth and density; language takes the shape of a natural phenomenon, like a tightly wheeling school of fish. Kevin Hartnett is a writer who lives in Ann Arbor, Mich. He can be reached at kshartnett18@gmail.com.